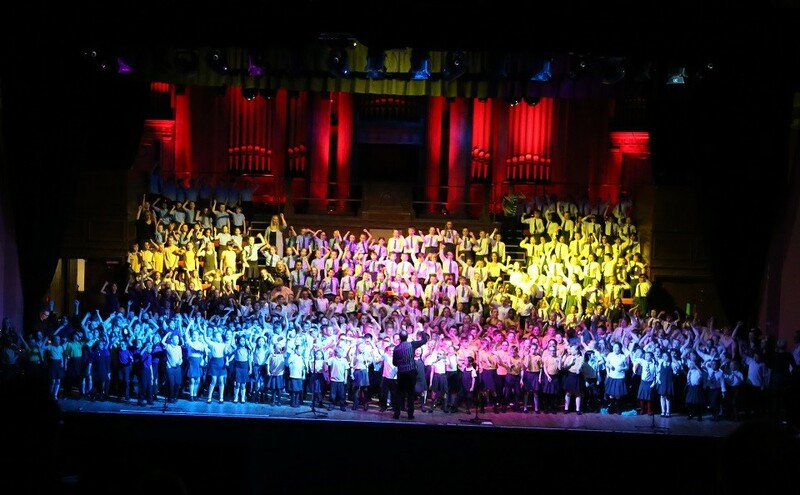 Over 4,000 children from 115 different schools across Lancashire came together in fine voice in a series of concerts organised by Blackburn Cathedral’s Music Outreach team. Eight ‘Sing Together’ concerts took place at King George’s Hall in March. Choirs from 22 Blackburn with Darwen schools were among the thousands of children who delighted audiences with their uplifting performances. Sing Together is a seven month long project in schools that empowers teachers to deliver music with confidence and instil a passion for performance and love of music in their pupils. Project organisers believe that every child has a right to find their voice through song and have access to quality music tuition. Through Sing Together, children learn nine songs off by heart, and the effects of singing from memory, learning music and participating in a concert all have well documented knock-on positive academic, social and wellbeing effects. The culmination of the project are the concerts held over eight separate evenings in King George’s Hall, giving young people the exciting experience of performing on a large stage. The children delighted audiences of around 8,000 people with their fantastic singing and their enthusiasm for performance. There is no religious direction to the Sing Together project as it invites children and teachers from all faiths and all walks of life to sing side by side, in harmony and union. Exuberance, exhilaration and an overwhelming sense of pride and joy is evident at the concerts. For the children, it’s the ‘cup final’ of their singing journey. Teachers and parents are delighted with the way their children step up to perform – often it gives the children from the most deprived wards the chance to shine and feel the buzz of performing. The children also experience singing with live accompaniment and stage lighting, a rare treat and one which is etched on their memory forever. It genuinely was an uplifting experience to be in the audience for the Sing Together concerts. It’s a joy to watch the children’s faces as they sing – they put their whole being into it. To see their pride as they gave such professional performances in a large concert venue was absolutely brilliant. This project is a such a positive way to bring together pupils from different schools, areas and towns across Lancashire to give them an experience they will never forget. Lots of work by Gill and her team make this possible, and of course the teachers and parents play their part too. We’re already looking forward to next year’s Sing Together: a further 20 schools have signed up to take part, bringing our total to 126 – over a quarter of Lancashire’s Primary Schools! If you would like to support your local school to take part or for more information about Sing Together, get in touch with Gill Fourie on gill.fourie@blackburncathedral.co.uk. Gill is now looking forward to bringing 400 children from Blackburn with Darwen schools together with the Blackburn and Darwen Brass Band and a number of adult choirs for the Sing Together 10th Birthday concert at King George’s Hall on Thursday 13th June 2019.